The Fellowship was fortunate enough to obtain a copy of JOHN FLOOD #1 from BOOM! Studios. Justin Jordan writes, Jorge Coelho draws and Tamra Bonvillain colors. Alexander Berry is a cop who was found not guilty, but who paid for that with his career. After an unusual meeting in his local diner, Berry visits the home of a private investigator named John Flood. Flood claims that he was the subject of government experimentation and that now he literally doesn’t sleep. What he does, though, is see patterns where none appear to exist, and he has found the pattern of a (nearly) perfect serial killer. 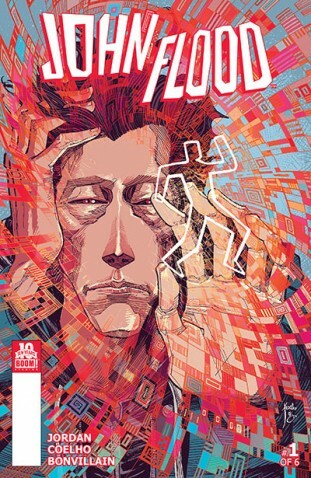 Flood is an interesting twist on the “superior detective” concept, what with the sleep deprivation inducing serious hallucinations pretty much all of the time. His methods are chaotic, but he seems to be the best. He’s also really likeable, maybe even pitiable to a degree, and clearly very well written. The art is very cool, too, between Berry’s complete control in fight scenes and the intricate detail in the backgrounds. If you like your crime stories cranked up to 11, then you’ll appreciate this book. If not, just get it for the quirky characters and awesome art. That’s fine too. JOHN FLOOD #1 is available now at your FLCS or at boom-studios.com.